First, you should take everything on the toilet off. If you have pictures or books or tissue boxes on the top, take them off so you can clean the toilet. You can clean these items later before you put them back on. Keep them somewhere safe where they won’t get sprayed with the toilet cleaner and disinfectant or water while you’re cleaning the toilet. Take the clean gloves and put them on. We suggest that you use a dedicated pair of gloves for the job. You don’t want the bacteria from the toilet being spread to other household cleaning tasks. If you must, buy your toilet-cleaning gloves in a different color than your other rubber gloves so they don’t get confused. Next, you should wipe down the toilet with a damp sponge. Give it a once-over with hot water. You should wet with water and wipe around the tank, lid, seat, base and exterior of the bowl. This might be enough to remove the dirt without specialty cleaning products. If not, you can clean with a disinfectant or toilet bowl cleaner later on. Now you can apply with a toilet cleaner to the inside of the bowl. Toilet cleaners help eliminate stains, rings and mineral deposits in your toilet. Squirt the cleaner on the inside rim of the toilet bowl, allowing it to drip down the sides of the bowl and in the water. Read the instructions on the cleaner because some cleaners require time to sit for maximum cleaning effect. If so, take a short break and then continue. It’s time to scrub the bowl with a toilet brush. You should use a brush with firm bristles. Scrub the bowl thoroughly and pay attention to any mineral stains that have accumulated at water level or the back of the bowl. The more thoroughly and firmly you scrub the bowl, the cleaner it will get. To get the most out of your toilet bowl cleaner, dip the brush in the toilet water and grab some suds to clean the bowl. It will give you extra cleaning power. Once the bowl is scrubbed and clean, you should flush. This rinses the bowl. You should continue to scrub as water drains from the toilet because the motion of the water alone might not be enough to rinse the dirt away. If you have persistent stains, repeat the process of applying toilet cleaner through rinsing the bowl. Do it as many times as you need to to clean the toilet bowl. Now that the bowl is clean, you can clean the rest of the apparatus with disinfectant. Clean the bottom, the top and all around the toilet. Don’t forget the handle because it has bacteria on it too. Once it’s sparkling, wipe up the residue with a dry cloth and then you’re done. All you need to do is clean the items that were on the toilet before you started cleaning and then put them back where they belong. 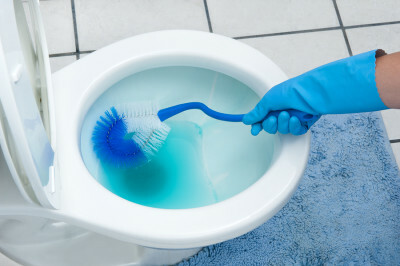 If you need help cleaning your toilet or don’t feel like doing it yourself, Maids Around Town can help. Give us a call in Austin at 512-782-4578 or Houston at 832-930-3210. We’re happy to take care of this for you!